In February of 1848, Mexico and the United States signed a treaty which ended the Mexican War and yielded a vast portion of the Southwest, including present day California, to the United States. Several days earlier, January 24, 1848, gold had been discovered on the American River near Sacramento, and the ensuing gold rush hastened California’s admittance to the Union. With the Gold Rush came a huge increase in population and a pressing need for civil government. 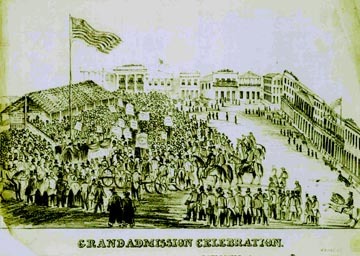 In 1849, Californians sought statehood and, after heated debate in the U.S. Congress arising out of the slavery issue, California entered the Union as a free, nonslavery state by the Compromise of 1850. 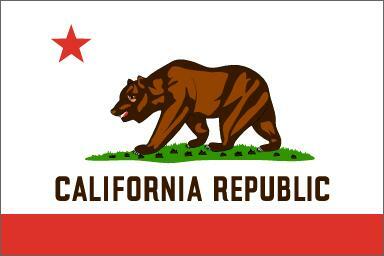 California became the 31st state on September 9, 1850. The Golden State’s rich history has since been shaped by people of every ethnic background who traveled here seeking economic, social and educational opportunity, and a life of quality and breathtaking beauty. California situated its first capital in San Jose. The city did not have facilities ready for a proper capital, and the winter of 1850 - 1851 was unusually wet, causing the dirt roads to become muddy streams. The legislature was unsatisfied with the location, so former General and State Senator Mariano Guadalupe Vallejo donated land in the future city of Vallejo for a new capital; the legislature convened there for one week in 1852 and again for a month in 1853. Again, the facilities available were unsuitable to house a state government, and the capital was soon moved three miles away to the little town of Benicia, inland from the San Francisco Bay. The strait links San Pablo Bay to Grizzly and Suisun Bays deep in the interior. A lovely brick statehouse was built in old American style complete with white cupola. Although strategically sited between the Gold Rush territory of the Sierra Foothills and the financial port of San Francisco, the site was too small for expansion, and so the capital was moved further inland past the Sacramento River Delta to the riverside port of Sacramento in 1854. Sacramento was the site of John Sutter's large farm and his fort. In 1846, during the midst of the Bear Flag Revolt, the fort was an oasis. A war was being fought between American and Californio soldiers in the southern part of the province for control of California. But at Sutter's Fort, life on the frontier continued with rhythm of the seasons and arrival of new soldiers. The town was founded by John Sutter, Jr. while the elder Sutter was away, at the river's edge and downhill from the fort. Sutter Sr. was indignant since this place, shaded by water-needy Cottonwood trees, was often under water. Indeed, every hundred years or so, the whole Great Valley from Chico to Bakersfield, was one great freshwater sea. However, lots were already sold, so there the town of Sacramento stayed. At the end of the century, the streets were raised a full story, so buildings in Old Town Sacramento are now entered through what were once doors to the balconies shading the sidewalks below. 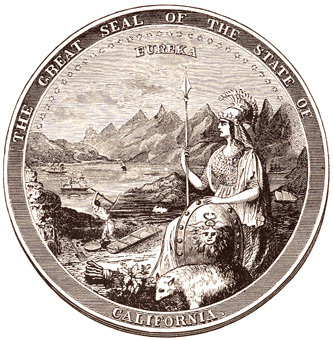 The Greek word "Eureka" has appeared on the state seal since 1849, when California sought statehood, and means " I Have Found It ." The words were probably intended to refer to the discovery of gold in California. Archimedes, the famed Greek mathematician, is said to have exclaimed "Eureka" when, after long study, he discovered a method of determining the purity of gold. In 1957, attempts were made to establish "In God We Trust" as the state motto, but "Eureka" was made the official state motto in 1963.